Casiodoro de Reina or de Reyna (c. 1520 – 15 March 1594) was a Spanish Lutheran theologian who (perhaps with several others) translated the Bible into Spanish. Reina was born about 1520 in Montemolín in the Province of Badajoz. From his youth on he studied the Bible. In 1557 he became a monk of the Hieronymite Monastery of St. Isidore of the Fields, outside Seville (Monasterio Jerónimo de San Isidoro del Campo de Sevilla). At this time he had contact with Lutheranism and he became an adherent of the Protestant Reformation. He fled with about a dozen other monks when they came under suspicion by the Office of the Inquisition for Protestant tendencies. He first turned to John Calvin's Geneva but he did not find the atmosphere of doctrinaire rigidity of the Calvinist Church to be welcoming. In 1558, Reina declared that Geneva had become "a new Rome" and left. Reina traveled in 1559 to London, where he served as a pastor to Spanish Protestant refugees. However King Philip II of Spain was exerting pressure for his extradition. In Seville, in April 1562, the Inquisition made an auto-da-fé in which an image of Casiodoro was burned. The works of Reina and his colleagues were placed in the Index of prohibited books and he was declared a "heresiarch" (leader of heretics). About 1563 Reina went on to Antwerp where he became associated with the authors of the Polyglot Bible. In April 1564 he went to Frankfurt, where he settled with his family. Reina wrote the first great book against the Inquisition: Sanctae Inquisitionis hispanicae artes aliquot detectae, ac palam traductae ("Some arts of Holy Inquisition"). This work was printed in 1567 in Heidelberg under the pseudonym: Reginaldus Gonsalvius Montanus. He secretly translated the work of the critic of Calvin, Sebastian Castellion, De haereticis, an sint persequendi ("Concerning heretics, whether they should be Persecuted"), that condemns executions "for reasons of conscience" and documents the original Christian rejection of this practice. While in exile, variously in London, Antwerp, Frankfurt, Orléans and Bergerac, funded by various sources (such as Juan Pérez de Pineda) Reina began translating the Bible into Spanish, using a number of works as source texts. For the Old Testament, the work appears to have made extensive use of the Ferrara Bible in Ladino with comparisons to the Masoretic Text and the Vetus Latina. The New Testament derives from the Textus Receptus of Erasmus, with comparisons to the Vetus Latina and Syriac manuscripts. For the New Testament he had great aid from the translations of Francisco de Enzinas and Juan Pérez de Pineda. It is speculated that Reina's Bible, published in Switzerland in 1569, which became the basis of the Reina-Valera Bible, was a composite work of the expatriate Isidorean community, done by several different hands with Reina first among them. 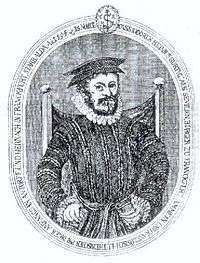 Reina was granted citizenship by the city of Frankfurt on 16 August 1571. During this period he worked as a silk trader, to get the money for his family. Step by step he became a true member of the Lutherans. About 1580 he published a Catechism, in the sense of Luther's Catechism, in Latin, French and Dutch. Reina died in 1594 in Frankfurt am Main. Estatutos para la sociedad de ayuda a los pobres y perseguidos, in Frankfurt. ↑ Balderas, Eduardo. "How the Scriptures Came to Be Translated into Spanish", Ensign, September 1972. 1 2 3 4 5 Erich Wenneker (1994). "REINA, Cassiodoro di". In Bautz, Traugott. Biographisch-Bibliographisches Kirchenlexikon (BBKL) (in German). 7. Herzberg: Bautz. cols. 1524–1528. ISBN 3-88309-048-4. Wenneker, Erich (1994). "REINA, Cassiodoro di". In Bautz, Traugott. Biographisch-Bibliographisches Kirchenlexikon (BBKL) (in German). 7. Herzberg: Bautz. cols. 1524–1528. ISBN 3-88309-048-4.